The bicentennial of the War of 1812 has received depressingly little notice even here in the Great Lakes region, home to several important sites of that conflict. An exception to this general apathy relates to a space on Chicago’s Near South Side where, on August 15, 1812, a band of Pottawatomie overwhelmed about 100 evacuees from the US Army’s nearby Fort Dearborn. The confrontation was a rout: 28 American soldiers were killed and 28 were captured. Civilian losses–a complicating matter in the ongoing memory of the event–amounted to 14 killed and 15 captured, including 3 women and 12 children. The Anglo-American perspective of the event prevailed as the dominant interpretation of the violence, most notably in the seemingly undisputed appellation “The Fort Dearborn Massacre.” However, as many American Indians have sardonically noted over the years about white-Indian conflicts, ‘When the whites win, it’s a “battle,” when the Indians win, it’s a “massacre.”‘ Controversy over the event’s name culminated in the Chicago Park District’s official christening of “The Battle of Fort Dearborn Park'” in 2009, complete with a procession by members of the Pottawatomie tribe. 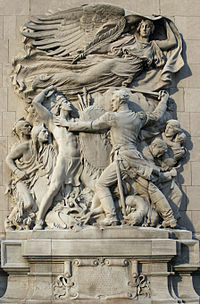 Henry Hering’s depiction of the “Fort Dearborn Massacre” on the Michigan Avenue bridge house. With the recent bicentennial of the event, media once again focused on the politics of memory as centered around the place name. All the major media outlets seemed to offer the classic ‘point/counterpoint’ format as a way to investigate the stakes of the Battle/Massacre designation. Historians–academic and avocational–weighed in on both sides. The Chicago American Indian population–often treated as a piece of the distant past–received a rare moment of visibility. Predictable cries of ‘political correctness’ ran amok among those unsympathetic to the American Indian memory of the event. Language is a subtle yet often decisive means of expressing memory. For example notice how when introducing the topic in this post, I attempted to offer ‘neutral’ or objective language. I avoided the loaded terms of ‘battle’ and ‘massacre’ in favor of softer (yet nonetheless problematic) words like “overwhelmed” and “confrontation.” In employing the passive phrase “28 American soldiers were killed and 28 were captured” I actually obscure the active role of the Pottawatomie warriors, thus removing them as agents and avoiding any need to assign moral accountability. What other loaded terms do public historians avoid or embrace when managing interpretation? New voices, or at least voices previously ignored by fashioners of the hegemonic narrative, changed the debate about what to call the Fort Dearborn conflict. American Indians, obviously, have long been a feature of the Chicago area. But an influx of American Indians into the city after the BIA’s Urban Relocation Program of the mid-1950s ushered in a new era of Indian activism. Local Indian activists found the controversy over the place name to be an ideal moment to remind the media of their longstanding and much broader grievances over depictions of modern and historical American Indian life. How have “new voices” impacted other interpretive revisions? What tactics of counter-memory have they employed to achieve their aims? Do public historians effectively foster connections with these voices? Not all attempts to revise are successful. The City of Chicago agreed with American Indian desires to rename the event. However, this certainly does not guarantee its adoption by most of the public who have known it as the “Fort Dearborn Massacre” for generations. For example, in its interpretative piece on the event the Chicago History Museum avoids using either “battle” or “massacre” much in the way I do at the top of this post. How do public historians judge ‘success’ in revising interpretation? I could offer many more points about this topic. But I will leave some work for those of you interested in the roundtable, either here in its blog form or at the conference on November 3. Academics really need to cut the crap. In this case he decries the use of the Political Correctness Card but engages in the very obtuse, overly sanitary, literary style that is grating to the average Joe who may benefit from the development of such civic and cultural venues.This historical event was just what it was-a MASSACRE pursuant to a military engagement. It is not the first nor last time it will happen in the course of human events.